I’ve spent the better part of an hour writing, deleting, and rewriting something to accompany this recipe. To be blunt, I’ve got nothing. Heck, I don’t even have a photo of the Paprika Roasted Salmon. But don’t let any of that stop you from trying Paprika Roasted Salmon. Adapted from McCormick & Co.
BAH Note: The original recipe, which was an add in Fine Cooking magazine, called for the salmon to first be marinaded for 30 minutes in a mix of orange juice, olive oil, and thyme leaves. I’m sure that would be lovely if you were so inclined to give it a try. Heat the oven to 400 degrees and line a sheet pan with aluminum foil. 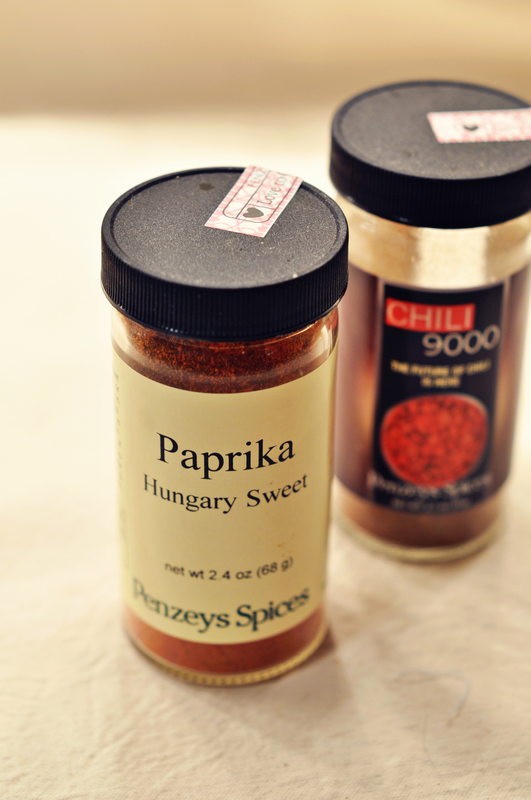 Combine the sugar, paprika, chili powder, cinnamon, orange zest, and salt in a small bowl. Use a fork, or your fingers, to thoroughly combine the spices. Place the salmon skin side down on the baking sheet and rub the spice mixture into the salmon. Roast for 10 to 20 minutes, depending on the thickness of your fish, until it easily flakes with with fork. Sometimes words are not necessary. Mmm Penzey’s. My friend out here is obsessed and has like 50 of their spices! She has yet to take me down to the Rockville store, when we do I know I’m going to be obsessed too! Elizabeth, be prepared to drop an insane amount of money if you go to the store. It is to spices what Sephora is to cosmetics…I can’t walk out of there with just one thing. dw is obsessed with Penzys. would this work for any fish, or is salmon the only way to go? Everyone should be obsessed with Penzy’s. I need to start working on my list for the next trip down there. Perhaps you and DW would like to join me? You could probably give this a try with just about any fish. yes! a penzy’s trip. he gets catalogues etc and it’s always chalk full of coupons etc. That’s exactly how I’ve been feeling these days . . . I have no idea what I’m writing about next week. Every time I pull up ‘new post’ my mind just sits there, inactive, completely blank. I’m hoping it’s just summer funk. The words have to return sometime, right? I just finished a post like this a bit ago…nothing fun or snarky…just something I made I had to share. Nothing wrong with that. But what struck me here and is a sign? So, I did. And I have salmon. It will be done! Barbara, that was most definitely a sign. Chili 9000 is now what I reach for constantly when I want to spice something up. I use so much of it that I bought the pound container last time I went to the Penzy’s store. Just read your comments over at Booshy. You seem to have turned out just fine my dear. and your food, my god….You and Kitch, always a treat. Hahahahaha 🙂 LOL. That is so funny, I totally hate it when you keep looking at the computer screen for inspiration and all you see is that darn curser just keeps on a flashing. Hmmm…. Paprika spiced Salmon, how about a risotto cake and maybe a buerre blanc, perhaps some green veggies, like brocolini or asparagus. So glad to hear it was a hit.